Tomatoes, salt cod, pork, almonds, garlic, olive oil, and mushrooms for instance make regular appearances at the table. 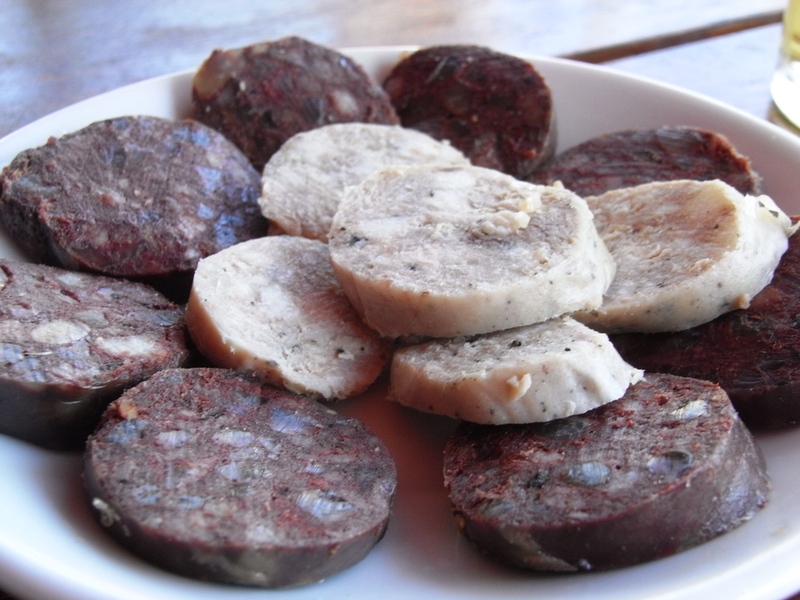 Stews are thickened with picada’s, i.e nut pastes with garlic and other seasonings and sausages are everywhere. Complex dishes are not uncommon and food is not meant to be rushed. Breakfast is usually a strong coffee and chocolate churro’s, croissant or pastry. If you are hungry, tasty omelettes, grilled ham and cheese sandwiches and sausages are easy to get. Lunch, as in other parts of Europe, is the main meal of the day. It is a multicourse event starting around 2pm and finally dinner is served at 9pm when you might want to seek out a plate of tapas. This is everywhere! 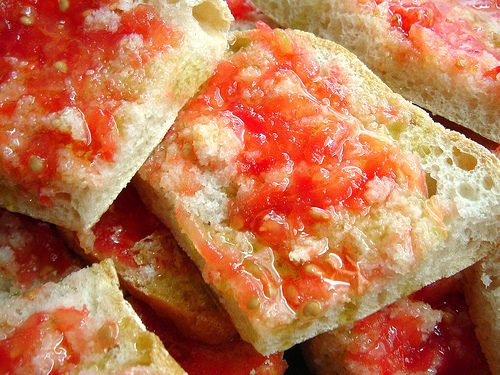 A toasted piece of bread rubbed with garlic, drizzled olive oil, lightly coated with tomato and salted, will be served at breakfast, lunch and dinner. Catalan’s famous pork sausage is on every chef’s list to sample. These delicacies are a time honored tradition dating from roman times and there are 17 official varieties. Try with white beans. If you happen to visit in the Autumn! Beef stew with mushrooms is a local dish worthy of attention. Barcelona’s version of cannelloni, they are delicious and generally filled with a meat filling. A very traditional soup/stew with a delicate broth, vegetables, beans, and meat that is delicious and filling! A must try when visiting Barcelona. 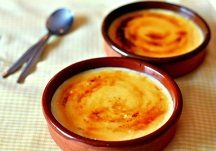 Just another way of saying Crème Brulee, which translates to, always delicious! Barcelona is a foodie’s dream. There is so much to discover on the food front here, you will have something new to discover everyday. Be sure to pay a visit to the amazing Boqueria market to get the overall feeling of the place, and the chocolate museum too.